We now sell our Rabbit Haven Specialty Hay, which is a truly delicious mix of Timothy Hay, Orchard Grass, and Canary Grass. You can pick it up in Carnation or in Green Lake. If you are interested in buying our hay ($10 per bag proceeds go to the Rabbit Haven bunnies! ), just contact us. 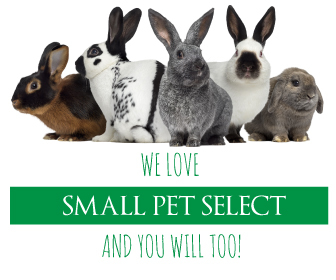 Small Pet Select delivers the freshest timothy hay, as well as food, bedding, snacks, and more for rabbits, guinea pigs, hamsters, ferrets, chinchillas, and other small critters. "Welcome to AmericanPet.com, where we can provide you with HEALTHY HAY PRODUCTS for Rabbits, Guinea Pigs, Chinchillas, Prairie Dogs and many other hay eating animals!" Located in Seattle, WA this place offers supplies and multi-level rabbit condos for sale. Manufacturer of products for rabbits and cavies. They offer stackable cages, house cages, transport cages, exercise pens, nest boxes, and feed & water supplies. Offers bunny abode condos, food & hay, treats, litter, toys, and care items. "Used and recommended by top exotic animal veterinarians worldwide, Oxbow offers an extensive line of superior quality, high-fiber hay and pellet products for rabbits, guinea pigs, chinchillas, prairie dogs and adult pet rats." "Welcome to the Rabbit Stop! We know you will enjoy our selection of the finest Rabbit products at great prices. Make us your one stop shop for your rabbit needs!"